Today's bugs love was made from 2 rice balls. And for today's 'green' baran, I chose 2 colors corn. This bento will be my second entry for B.O.M.B Challenge this month. If you would like to join, please read more on Hapa Bento. It's fun to participate! Kids have been busy reviewing their lessons lately because they will have mid test at the end of March. I will not make any exercise papers for them this time. Hope they can read and study their lessons without my help. Inside today's bento ... (green box) : 2 rice balls stuffed with tuna curry, pea pods, and carrot flowers ... (yellow box) : noddle, brussel sprouts, beef, chikuwa, 2 colors corn, baby kiwi, grape tomatoes, and kumquats. Love the pooh picks too! So unique! very creative use of corn for baran too! 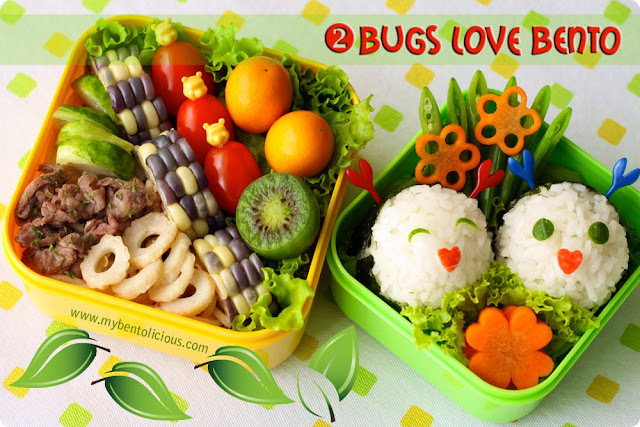 Lovely and sweet bento from you! great bento, two colour corn - unusual, haven't seen these but used to great effect in the bento. The bugs love looks really like a happy couple. I have never seen a 2 colors corn before, lovely presentation. Hehe, those bugs are really cute. @Lil'chan : Thanks a lot Lil'chan! As always you bento is so colorful and tatsy looking. mmm, the tuna curry sounds so yummy, and i agree with sheri, the heart picks are fun and make great antennae! and i would never have thought of corn for baran - you are so creative lia, i love your work! Wow that corn is a brilliant baran! It's so colorful and fun! Adorable onigiri! But I'm gonna eat them in a mouthful right now, I'm hungy, haha. So nice colors of the corn slices. These came out beautiful barans, that's great idea!! Oh I love it I love it!! So pretty! The carrot flowers are amazing,I need to learn to make mine in a different shape.. Very cute! I love the use of the two color corn for the baran. Omg i met another new mom on BENTOing...Kudos, Lia Chen. Nice meeting you. Btw, i m linking ur banner to mine also. I ll drop by more often on ur yummylicious blog. Love all the colors combi there and the 2-color corn is such a great idea! Your carrot flowers are so beautiful! And I love the idea of using the corn as a divider, which is reminding me to enter the BOMB challenge this month! @Kuusou : Thanks a lot for your nice comment! @Rachel Hei : Thanks a lot Rachel! You are so sweet!